Just as it appeared as if the Florida Gators were headed for an in-season quarterback battle, head coach Dan Mullen’s options appear to now be limited. Redshirt sophomore QB Kyle Trask suffered a non-contact injury during practice on Wednesday, according to 247Sports’ Thomas Goldkamp, who reported that Trask injured a “lower-body extremity” and was carted off the field. Hours after the report, the quarterback’s father, Michael Trask, posted on Facebook that his son fractured his foot in the normal pace of practice. 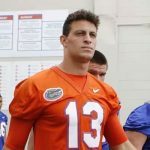 “Gator Nation, I am sad to say that Kyle was injured today in practice while doing a trick play where he hands off to the RB and then goes out for a pass. The throw to Kyle was low and when he planted his foot to catch the pass he felt a pop,” Michael wrote, per the Orlando Sentinel‘s Edgar Thompson. 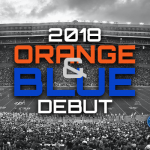 Kyle Trask, who took over for classmate Feleipe Franks during the second half of Florida’s blowout loss to Missouri last week on homecoming, was listed behind Franks on the depth chart released by the Gators this week but expected to see extensive action for Florida on Saturday against South Carolina. Mullen indicated this week that he could play two — or even three — quarterbacks in the game. Trask completed 10-of-18 passes for 126 yards and a touchdown against Mizzou, though Mullen said he and Franks graded within one point of each other upon reviewing game film. It was by far the most extensive action Trask has seen with Florida as he previously completed 4-of-4 passes for 36 yards with a rushing touchdown as a reserve in two games earlier this season. Trask sat out as a true freshman and missed the entire 2017 campaign while recovering from a foot injury. It is unknown if this fracture is to the same foot. 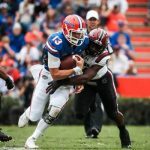 With Trask sidelined against the Gamecocks and for the remainder of the season, it will be interesting to see what Mullen does with his quarterbacks. Freshman Emory Jones has already played in two games this season and therefore can only see action in two more contests while still preserving his redshirt and a year of eligibility. With the Gators neither playing for a national title, an SEC title nor a New Year’s Six bowl game, it would make little sense to burn Jones’s redshirt. The expectation was that Mullen would hold Jones out the next two games so he could see action in the season finale at Florida State and in the bowl game, but this development could put a wrench in his plans. Franks could see all the action with Florida simply living or dying with him under center, Mullen could use one of Jones’s remaining games to get him immediate action, or Mullen could get creative with the offense, possibly employing sophomore Kadarius Toney with more direct snaps in the backfield as a supplement to Franks. As far as Trask is concerned, this is the best-case scenario for a potentially bad situation. It does not appear as if his 2019 campaign will be at risk, though he will be competing for the starting job with Franks and Jones, who fans — and likely coaches — hope develops over the spring and summer into the team’s starter. Mullen already has a quarterback committed for 2019 and likely wants to add another, meaning Trask could wind up far down the depth chart if he does not bounce back from this injury quickly. An official diagnosis has not been released by the Gators, nor has the team commented on Trask’s status. Too bad for Trask. I was hoping to see him start. They should just burn Jones redshirt whether he starts or not. It’s not like he’s going to be at UF for 5 years anyway if he’s any good. Oh, and BTW how do Trask and Franks grade out a point apart. Is it 1 pt between a B+ and an F? Ha ha. I was wondering the same thing. I suspect there is a hell of a QB in Trask. He wouldn’t be the first talented guy that the coaches overlooked for too long before he got his chance. Gator fans should only hope for one outcome: that the BEST player get the job, and that goes for every position, not just QB.